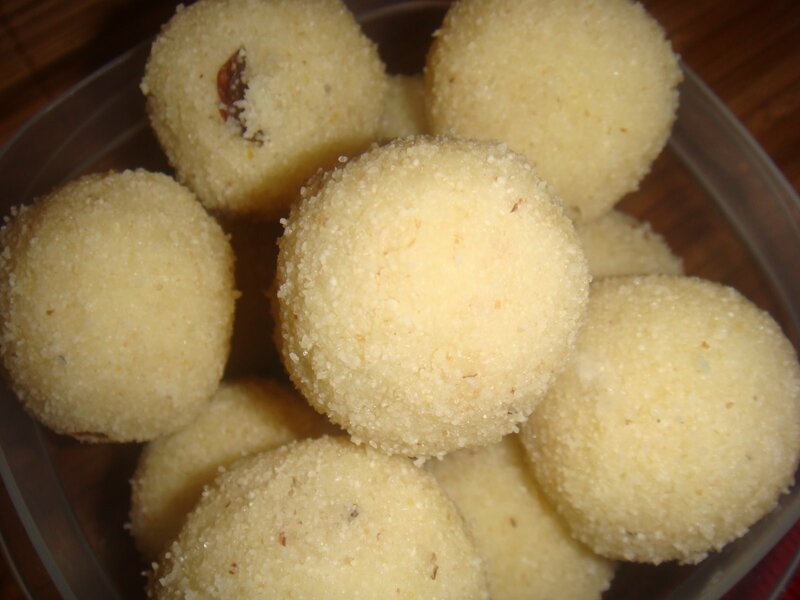 Rava Laddu: Rava laddu or Rava ladoo is a simple and exotic Indian sweet made with Semolina or sooji. Rava laddu is one of the common sweet prepared in almost every household during festivals of Krishna Jayanthi, Ganesh chaturthi and Diwali. Grated coconut, roasted rava, ghee, dry fruits and nuts, and sugar is all you need to make a delectable platter of homemade rava laddoos. Heat the ghee in a pan, on low heat. Roast the cashew nuts and raisins. Heat the semolina in the same pan, on medium heat. Roast the semolina till fragrant. Add in the grated coconut. Fry the mixture, stirring continuously, for 2-3 minutes. Cook the mixture, stirring continuously for 5-6 minutes. Slowly add in the milk to the mixture, stirring continuously as you do so. Add in the green cardamom powder, roasted cashews and raisins. Once all the milk is added, continue to mix until the mixture comes together. The mixture will be quite moist and will stick around your ladle. Cool down the mixture, till it is warm enough to handle. Make into lemon-sized balls and gently set aside. Rava Laddu’s are ready to be served. If the rava laddu mixture is too dry, sprinkle water or milk as you shape the laddu. Instead of using milk, you can use water or a mix of water and milk. If you are using only water, it will increase the shelf life of the rava laddu. Adjust the sugar to your preference. This recipe gives you a mildly sweet rava laddu. This recipe gives you soft ladoos. If you prefer the firmer ones, decrease the amount of milk / water. If you have any queries regarding the Rava Laddu recipe, please leave a comment.